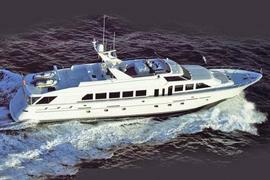 The first-half sales figures at the end of this month are going to be interesting as Bob Cury at RJC Yachts tells me he represented both buyer and seller in the sale of the 34.87m motor yacht Lady Dorothy. Lady Dorothy was built in GRP by Hatteras to a Jack Hargrave design in 1996 and most recently refitted in 2010. A cool, contemporary interior by Dee Robinson sleeps eight guests in a master suite, two double staterooms and a twin cabin. Twin 1850hp MTU engines power Lady Dorothy to a cruising speed of 17 knots. She was asking $3.295 million and Bob tells me she's been renamed Good Times.